Adding an expense but confused about where it should go? Look no further than this illuminating guide! We've pulled these categories, descriptions and examples straight from the IRS but if you feel like we are missing something here, be sure to reach out to your friendly COs in our in-app support chat and we'll be happy to pass your suggestions to the team! Any materials for promoting your business and the cost of developing those. Examples: Flyers, signs, ads, branded promo items, events, or trade shows & PR firm or designer costs. You may deduct bank fees (not interest-related) associated with any business bank accounts, credit cards or loans. Examples: Annual/monthly maintenance charges, wire/ACH fees, processing fees, overdraft charges. Insurance intended to protect your business. Examples: Fire, theft, flood, property, malpractice, errors & omission, general liability, malpractice. The cost and upkeep of work clothes. Must meet both requirements: 1) You must wear them as a condition of your employment. 2) The clothes aren't suitable for everyday wear. The business portion of your actual car expenses and depreciation (or public transit expenses if you use local transportation). OR you can use the standard mileage rate to figure your car expenses. Keep in mind it can be one or the other but not both. Examples: Gas, insurance, registration, repairs and maintenance & buses. Cash payments to an organization, charitable or otherwise, may be deductible as business expenses if the payments are not charitable contributions or gifts and are directly related to your business. If you donate to a qualified organization, you will receive a deduction if the money is not set aside for use by a specific person. Commissions you paid to anyone that were not included as part of a 1099-MISC payment. Any payments made to independent contractors. Anything that ultimately becomes part of products you sell or distribute to customers. The amount you paid for dental insurance for yourself, your spouse, and your dependents. Depreciation expense on business assets. Subscriptions to professional, technical, and trade journals that deal with your business field. Costs of benefits provided to your employee(s) outside of their salary. Examples: Accident and health plans, adoption assistance, cafeteria plans, dependent care assistance, education assistance, welfare benefit funds (limited). You may deduct only 50% of expenses for entertaining clients or customers for business purposes. Keep in mind that if you are audited, you must be able to show some proof that the entertainment expense was either directly related to, or associated with, business. So, keep a guest list and note the business (or potential business) relationship of each person entertained. Examples: Taking a client to a ball game, a concert, out for drinks. Note: Parties, picnics, and other social events that you put on for your employees and their families are an exception to the 50% rule -- such events are 100% deductible, and you need not prove it was directly related to a business goal. Equipment used to conduct your business. Fees paid for filing your business with the state you operate in. Gifts given in the course of your trade or business. You can deduct no more than $25 for business gifts you give directly or indirectly to each person during your tax year. The amount you paid for medical insurance and qualified long-term care insurance for yourself, your spouse, and your dependents. Examples: Business portion of rent, repairs, insurance, mortgage interest. Note: You’ll need to fill out a Form 8829, unless you use the Simplified Method. Calculate the percentage based on the actual amount of time you use your home internet for business purposes. 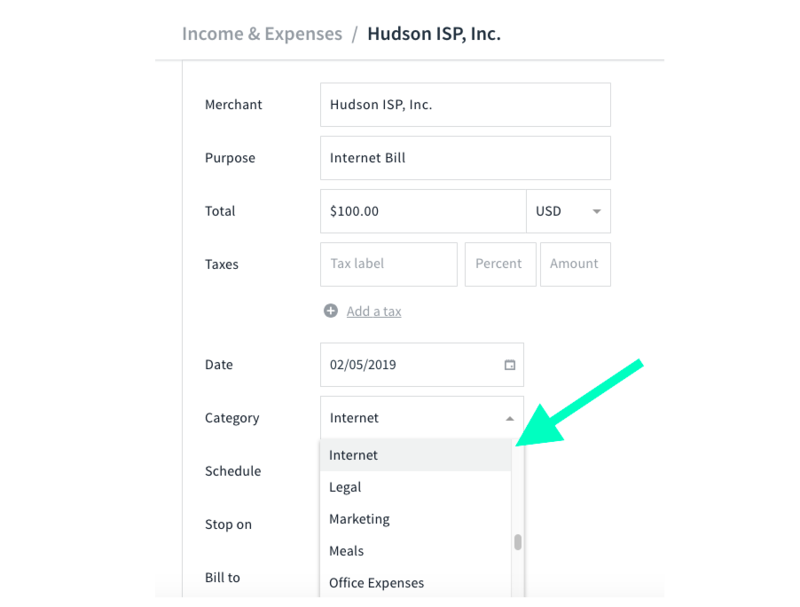 Note that you can deduct your Internet costs whether or not you take the home office deduction. Interest paid on a mortgage for property used for business, other than your primary home. You may receive a Form 1098 from the lender if you pay mortgage interest during the year. Other types of interest. You can only write of the portion related to business, and not the portion related to personal. Credit card interest is only deductible if it's for a business credit card. Examples: Business credit cards, business lines of credit, interest on car payments. Internet-related expenses including domain registration fees and webmaster consulting costs. Legal expenses that you incur in attempting to produce or collect taxable income or that you pay in connection with the determination, collection, or refund of any tax. You can also deduct legal expenses that are: Related to either doing or keeping your job, such as those you paid to defend yourself against criminal charges arising out of your trade or business, for tax advice related to a divorce (if the bill specifies how much is for tax advice and it is determined in a reasonable way), or to collect taxable alimony. Fees paid for professional services employed that are related to your business. An umbrella under which most activities that involve creating, producing, bringing to market, and selling a product or service fall under. Examples: Costs of administering surveys, creation of advertising, purchases and commissions, sales promotions, public relations efforts, product samples, websites, direct mail. Meals that you had with a client or potential client and during which you engaged in business discussions, or meals had while traveling on an out-of-town business trip. Office expenses that do not fall under a separate category. Examples: Cleaning services for office, general office maintenance, postage and mailings. Any other business expenses that are ordinary and necessary. Costs of diagnosis, cure, mitigation, treatment, or prevention of disease, and the costs for treatments affecting any part or function of the body. These expenses include payments for legal medical services rendered by physicians, surgeons, dentists, and other medical practitioners. They include the costs of equipment, supplies, and diagnostic devices needed for these purposes. Cost of 3rd party payroll service. Example: Gusto charges $39 + $6 per employee - if there is just one employee the payroll processing fee would be $45. Contributions you make to your employees’ retirement plans. The taxpayer’s business-use percentage is needed to calculate his or her deductible cell phone expenses. The business-use percentage should be calculated based on the time the cell phone is actually used (as opposed to calculating the percentage based on the time the phone is available for use). Any dues that are required by your profession, such as bar dues or membership fees to a professional or trade organization, and to chambers of commerce/similar organizations. If you are self-employed, you may take the full deduction. You can claim the amount of expenses that is more than 2% of your adjusted gross income. The amount you pay or reimburse employees for business expenses incurred for your business. Any taxes you have to pay to or for the lessor. Rent or lease payments on items that aren’t vehicles or equipment. Rent or lease payments on vehicles/equipment used for your business, not owned by you. Repairs or maintenance on business machines, equipment, or offices. Research expenses incurred while performing activities intended to create new products and services or improve on the existing offerings. Any "off-the-shelf" computer software that (a) is not custom designed, and (b) is available to the general public is qualified for the Section 179 Deduction in the year that you put the software into service. Business start-up and organizational costs are generally capital expenditures. However, you can elect to deduct up to $5,000 of business start-up and $5,000 of organizational costs paid or incurred after October 22, 2004. The $5,000 deduction is reduced by the amount your total start-up or organizational costs exceed $50,000. Any remaining costs must be amortized. Any supplies used for your business that you use and replace. Examples: Cleaning supplies if you clean homes, hot/cold bags if you do delivery. The amount you pay each year to state or local governments for licenses and regulatory fees for your trade, business, or profession. Ordinary and necessary expenses of traveling away from home for your business, profession, or job. The travel must be away from your residence, substantially longer than an ordinary day's work. This also includes expenses to meet your need to sleep/ rest to perform the demands of your work while away from home. Note: You cannot deduct commuting expenses (i.e. cost of transportation between home and regular place of work). Utilities related to your office.